The Cell & Sat associates acquired during their carrier a strong expertise in both the cellular and satellite fields. They have been previously employed by telecom operators or equipment manufacturers, and held various responsibilities including system definition, technical development, business planning, sales & marketing or field deployment of cellular or satellite networking products. Cell & Sat engineers contribute their deep knowledge of cellular radio systems to assist telecom operators in the technical and economical evaluation of their network. Several assignments concerned the impact of new 3G and 4G developments, emerging network architectures including macro cells as well as small cells, and the impact of fast growing IP data services. A particular focus of the company is the evaluation of preferred technologies to extend the coverage of telecommunications networks in rural environments. This includes the technical and economical assessment of satellite transmission systems used to replace or complement terrestrial backhaul infrastructure. Other recent activities have been involved with the design of cost efficient solar energy systems to serve cellular base stations. Cell & Sat is also invited by satellite operators to participate in their technical assessments, market evaluations or business plan simulation concerning the potential contribution of satellite systems to telecommunication networks. Recent studies included the impact of various broadband satellite technologies, including geostationary as well as low / medium earth orbit, and the analysis of High Throughput Satellites “HTS” with spot beams in Ku or Ka bands. 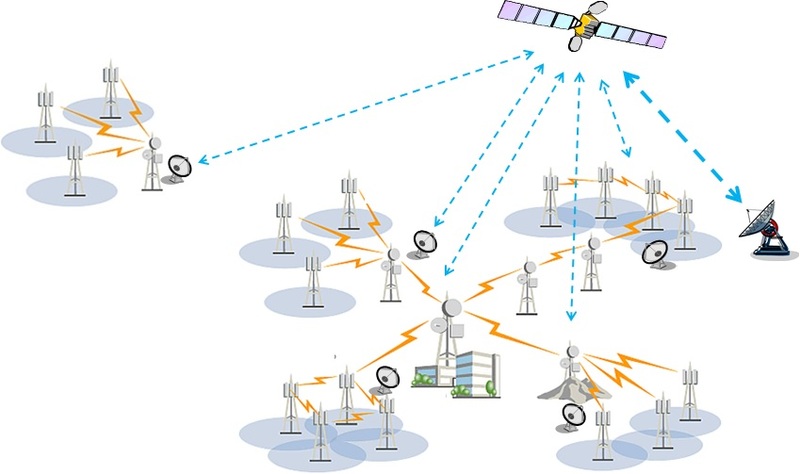 Figure below illustrates the possible use of satellite to connect remote cellular base stations or to complement preexisting terrestrial infrastructure. Cellular growth: soon 8 billions users !